DanceDanceRevolution X3 VS 2ndMIX's folder cover. First BEMANI game to feature a modernized version of an older game as a game mode. 2ndMIX MODE is a high-definition remake of DanceDanceRevolution 2ndMIX with all the songs except STRICTLY BUSINESS and the STEP BATTLE songs featured. However, this is not the first time 2ndMIX has been remade; a previous remake was done in DanceDanceRevolution 3rdMIX, using the 3rdMIX interface. Characters in 2ndMIX MODE no longer have their original dance routines. They use the routines introduced in DanceDanceRevolution X and DanceDanceRevolution SuperNOVA instead. 2ndMIX MODE also uses the same camera angles as the main game. Because of this, the dancers appear very small in-game. Interface theme is taken from DanceDanceRevolution II for the Nintendo Wii console. DRILL COURSE from X2 has been removed. Last DanceDanceRevolution arcade game to feature courses. All DanceDanceRevolution X2 licenses originally featured in DanceDanceRevolution HOTTEST PARTY3 have been removed. Subsequently, all licenses from A Different Drum records were also removed. A Clear Marker system has been added, replacing the clear notes from DanceDanceRevolution X2. If a player clears a song, a diagonal "sticker" will appear on top of the song's cover jacket. Different colors notate full combos on the song. Green with a circle mark: Song cleared with a Great Full Combo. Gold with a circle mark: Song cleared with either a Perfect Full Combo or Marvelous Full Combo. After selecting play style after selecting PRO mode, game will return to non-playing mode if neither Music Select nor Courses mode are confirmed for selection and the countdown timer is turned on. Target Score system added. The player can choose a different rival or their own score to track between songs. BEMANI TITLE sort option added. This sorts songs according to which of the other five major BEMANI series they also appear in. First DanceDanceRevolution game to use the Star system to determine if player gets EXTRA STAGE. First DanceDanceRevolution game where song selections under a selected folder are shown and the other folders are not shown. This is also seen in DanceDanceRevolution (2013). An update on August 2nd, 2012 introduced QUICK PLAY mode, in which the player may pay to play on a per-song basis using PASELI credits, rather than pay for a set of songs. EXTRA STAGE-exclusive songs can be played in Quick Play Mode with a normal lifebar as long as the player has 9 Result Stars. Last game in the X series of games. However, its interface and unlock systems would later be re-used in the subsequent game. First DanceDanceRevolution game to show one of four stepcharts in a song selection. Last DanceDanceRevolution game to feature accessories as wearable customization for characters. eAMUSEMENT support for DanceDanceRevolution X3 VS 2ndMIX ended on April 30th, 2013. APPEND TRAVEL was an event involving seven BEMANI series to promote the release of jubeat copious APPEND. Each BEMANI game received at least a brand new song, and could buy songs and special items using APPEND ENERGY. The event started on March 14, 2012 and ended on September 25, 2012. However, it was still possible to unlock the APPEND TRAVEL songs but not buy the event items after that. ALICE wearing the jubeat仮面 in X3. APPEND TRAVEL allowed players using e-AMUSEMENT to earn APPEND ENERGY (AE) by playing the 7 participating BEMANI games. It was the only way to buy the collaboration songs for play in jubeat. It was also possible to buy special items such as customisation options and abilities for use in the other games during the duration of the event only. Once bought, a notification for the item will appear on the next login in the game. The ENJOY LEVEL Boosters were enhanced (double effect) on August 2, 2012 to September 2, 2012 as part of the Summer Boost Campaign (サマーブーストキャンペーン). STAGE, a course or when the modifier LIFE GAUGE is set to RISKY. (エンジョイレベルブースター40) 500AE This support item speeds up the leveling process on ENJOY LEVEL 1 to 40 only. (エンジョイレベルブースター80) 500AE This support item speeds up the leveling process on ENJOY LEVEL 41 to 80 only. (jubeat仮面) 500AE This is a character accessory. 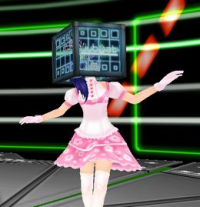 The jubeat cube is worn as a mask except for ZERO, he wears it as a crown. To unlock songs, the event required the players to get Daily Stars (★), an item also used to access the EXTRA STAGE. A Daily Star is obtained on the first new play session of the day when using e-AMUSEMENT. By default, TWINKLE♡HEART was unlocked on the very first day of the event, except for its CHALLENGE charts. In order to unlock the CHALLENGE charts, the player had to play five days in a row four times. It was possible to take a break after each set of 5 days. After September 25th, the requirements were reduced for the last four items to be unlocked by getting 4, 5, 6, and 7 consecutive Daily Stars respectively. At AOU 2012 on February 17th, 2012, KONAMI announced a new event called Daily Special (デイリースペシャル) for e-AMUSEMENT users only. It began on February 20th, 2012 and ended on May 28th, 2012. During the event, a different BEMANI crossover was unlocked each day of the week from Monday to Friday only. Each day began at 7:00 am following the daily maintenance. The cycle of the song unlocking had been shuffled three times, on March 19th, April 16th, and May 14th, 2012. On May 5th, 2012, an additional event called Weekend Special (ウィークエンドスペシャル) was added. During Weekend Special, the songs cycled hourly instead. This event also ended on May 28th, 2012, when all songs were unlocked for regular play. With the exceptions of REVOLUTIONARY ADDICT and Go For The Top, the following songs are remixes of DanceDanceRevoution and DanceDanceRevolution 2ndMIX KONAMI original songs, which appeared on the 2011 re-release of DanceDanceRevolution 2ndMIX ORIGINAL SOUNDTRACK album. ★★★ For obtaining the grade AAA. ★★ For obtaining the grade AA. ★ For obtaining the grade A. ★ For obtaining the grade B, C or D.
★ For a Full Combo. ★ For clearing a song above a certain level, depending on the player's title (see below). ★ Bonus after the first play session of the day (added on February 2nd, 2012). ??? Level 6 or higher. 足はじめ Level 7 or higher. 足戦士 Level 8 or higher. 足侍 Level 9 or higher. 足騎士 Level 10 or higher. 足貴族 Level 11 or higher. 足将軍 Level 12 or higher. 足王 Level 13 or higher. 足皇帝 Level 14 or higher. 足龍 Level 15 or higher. 足鳳凰 Level 16 or higher. 足紙さま Level 17 or higher. 足神 Level 18 or higher. 大足神 Level 19 or higher. If the player passes FINAL STAGE and has 9 Result Stars, they will unlock EXTRA STAGE. If they do not make it to 9, the Result Stars will carry over to the next play session via eAMUSEMENT. Each player can hold no more than 9 Result Stars. Once EXTRA STAGE is unlocked, the player's Result Stars are used and removed. During VERSUS PLAY, each player has their own set of Result Stars. If either player unlocks EXTRA STAGE, both players can proceed but both players' Stars will be used. If e-AMUSEMENT is not enabled or not available on the arcade machine, then Result Stars cannot carry over between rounds, and the only way to unlock EXTRA STAGE is to obtain exactly 3 Result Stars per song. Since each player can obtain a maximum of 3 Result Stars per song, Result Stars higher in the list above take priority over lower ones. For example, a player getting a AAA Full Combo on their first song of the day will receive the three white stars for a grade of AAA, and will not receive the green Full Combo star. The colors of the Result Stars have no importance for unlocking EXTRA STAGE. *Unlike the other Result Stars, the dark blue Daily Star is obtained on the end-of-game screen after the player's first round of the day, and is obtained even if the player fails some or all of their stages or does not play on PRO Mode. For example, if the player obtains 8 Result Stars on their first round of the day, they have not met the EXTRA STAGE conditions by the time they complete FINAL STAGE. However, they will receive a 9th star just afterward, guaranteeing that they will be able to unlock EXTRA STAGE on their next round. To unlock the ENCORE EXTRA STAGE, the player must get a rank of AA or higher on EXPERT difficulty on an EXTRA STAGE-specific song. No Result Stars are earned on either EXTRA STAGE or ENCORE EXTRA STAGE. At first, two exclusive songs, one for each STAGE (EXTRA and ENCORE EXTRA) were available. Similar to how EXTRA/ENCORE STAGE worked in previous games, more songs were added over time. This time around, songs were also added directly as EXTRA STAGE and others kept their ENCORE EXTRA STAGE-only status until they were finally unlocked for everyone. As of November 5th, 2012, all the songs introduced as EXTRA/ENCORE STAGE have been unlocked for normal play. EXTRA TOUR was announced on May 12, 2012 and started on May 14, 2012. In this event, four new songs were added as EXTRA STAGE. They each appeared in specific regions at first and moved to other regions each day. After playing all EXTRA TOUR songs at least once, any one of them could be used to unlock a new ENCORE EXTRA STAGE, Tohoku EVOLVED. On July 4th, 2012, the EVOLVED nonstop course was revealed, giving access to all five songs (TYPE1/Ver.A only) and revealing London EVOLVED Ver.A's CHALLENGE chart and Tohoku EVOLVED's DIFFICULT chart for the first time. The event ended on July 22, 2012. On the following day, all songs except Tohoku EVOLVED were freely available on the EXTRA STAGE. On August 2nd, 2012, London EVOLVED's remaining CHALLENGE charts were revealed in Quick Play Mode only. On September 26th, 2012, the four songs were unlocked for normal play and Tohoku EVOLVED's CHALLENGE charts were revealed in Quick Play Mode. On November 5th, 2012, Tohoku EVOLVED was unlocked for normal play. As of August 2nd, 2012, TRIP MACHINE REVOLUTION and PARANOiA Revolution can appear in EXTRA STAGE through the CROSSOVER DDR event in 2ndMIX MODE (detailed in its own section). Using one of them to successfully access ENCORE EXTRA STAGE will reveal a new song, LOVE IS THE POWER -Re:born- (a remix of a song that was previously only found playing during the ending credits of DanceDanceRevolution 2ndReMIX's ARCADE MODE). In order to clear this final ENCORE EXTRA STAGE, a PERFECT FULL COMBO is required. As of September 26th, 2012, Tohoku EVOLVED on EXTRA STAGE can be used to access LOVE IS THE POWER -Re:born- as well. BEMANI Linked Song Battle "Tsugidoka!" (BEMANI連動選曲バトル「つぎドカ！」) was a linked battle event between four BEMANI series. The goal was to find a winner song to be transplated to jubeat saucer. Each series had a representative song made by its sound director: TAG for DanceDanceRevolution X3 VS 2ndMIX, 96 for GuitarFreaksXG3 & DrumManiaXG3, PON for pop'n music Sunny Park, and Qrispy Joybox for REFLEC BEAT colette -Winter-. The event started on December 19th, 2012 with the four songs being added to the participating series (GuitarFreaks & DrumMania received rock arrangements of Cosmic Hurricane and snow prism). The winner song was selected using the total play counts on all the games combined at the end of the event on January 8th, 2013. The winning song 紅焔 was transplated to jubeat saucer on January 9th, 2013. The other songs were added to jubeat saucer on February 1st, 2013 via saucer bistro 5th set. 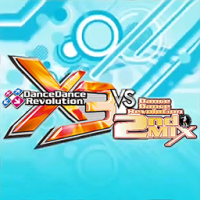 A completely redone DanceDanceRevolution 2ndMIX is featured as a separate mode in DanceDanceRevolution X3 VS 2ndMIX. This revamped version features high definition graphics, 2ndMIX dancing characters, remastered banners (with the original typos), and background animations. Nearly all of the original gameplay found in the game was kept such as the modifiers requiring command codes in order to use them, COUPLE Play being available, and hidden songs with various requirements each to make them appear. Also, all the old terminology was kept such as CUT1 returning to its former name, LITTLE. The new widescreen ratio (16:9 instead of 4:3). The game goes 60 FPS now, instead of the original 30. All the songs from the LINK VERSION, STRICTLY BUSINESS, and the three STEP BATTLE songs were not included. DREAD and JANET are the only possible characters. It is not possible to change them with AFRO and LADY. Some of the in-game sounds (particularly the crowd cheering and countdown) are borrowed from X3 rather than re-using the original sounds from 2ndMIX. 2ndMIX MODE difficulty is rated from 1 to 10, due to PARANOiA Revolution and TRIP MACHINE EVOLUTION having a 10 and 9 in their charts, respectively. Originally, all songs in the game were rated from 1 to 8. In NORMAL MODE (2ndMIX), TRIP MACHINE EVOLUTION will then be playable. In HARD MODE, PARANOiA Revolution will then be playable. As of July 4th, 2012, the Revolution boss course was revealed in X3, giving access to the two songs' DIFFICULT and EXPERT charts in X3 MODE (the course also included the four regular EXTRA/ENCORE STAGE songs). As of August 2nd, 2012, the CROSSOVER DDR event started, allowing players to unlock all 2ndMIX songs for play on X3's PRO or QUICK PLAY MODEs. The two exceptions are HERO, as the song is already in X3 (using the X-edit version from X2), and PARANOiA MAX～DIRTY MIX～(in roulette), as there is no Roulette option in X3. For their appearance in X3, every song received a brand new jacket composed of the disc seen in 2ndMIX. The song's banner was added on April 20th, 2012 at the bottom of the disc on the jacket. The unlocked songs appear in the X3 VS 2ndMIX folder instead of the 2ndMIX folder, but they would later return to their original folder, receiving jackets based on their backgrounds, in DanceDanceRevolution (2013). In 2ndMIX MODE, the song list is divided into two parts: EASY / NORMAL Mode and HARD Mode. Each song must be played in its respective 2ndMIX's sub-mode in order to be unlocked in X3. Both SINGLE and DOUBLE charts have to be unlocked individually on every difficulty available: BASIC, ANOTHER, and MANIAC (Single only). After unlocking the first chart for a song in Single Play, the BEGINNER chart is also unlocked. Clearing all the three difficulties will also unlock the CHALLENGE charts for play in X3 Mode. In Double Play, clearing the two difficulties will unlock the EXPERT and CHALLENGE charts for that song in X3. Unlocking TRIP MACHINE EVOLUTION and PARANOiA Revolution in X3 (as EXTRA STAGE) require special conditions: all the charts of that difficulty found in NORMAL and HARD MODEs, respectively, must be played. In addition, CHALLENGE charts (both Single and Double) are Quick Play Mode-exclusive. On November 5th, 2012, all the 2ndMIX songs were fully unlocked for everyone.